Branch Meeting & Back To Our Past, 19 October, 2013. John Burke was born in the Parish of St. Peter & St. Paul, Clonmel, Co. Tipperary in 1890, the son of Francis & Bridget Burke. He signed up as a Special Reservist in July 1908 serving as No. 5087 in the 3 (Reserve) Battalion Royal Irish Regiment (RIR). 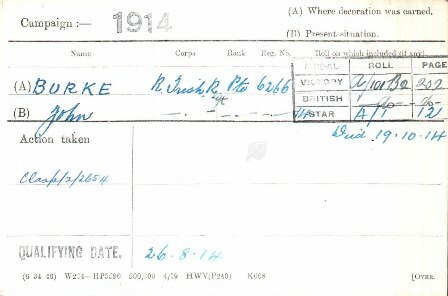 His term of engagement ended in February 1913 and 3 months later in May 1913 he re-enlisted for another four years in the RIR Reserves, this time being given the No. 6266. Following the declaration of war, John was mobilised on 7 August, and posted to the 2 Battalion, which was already on its way from Devonport to France, where they landed at Boulogne on 14 August. John’s Medal Index Card (MIC) shows that he landed in France/Flanders on 26 August. By this time the battalion had already seen action at Le Cateau and taken part in the Retreat from Mons. In mid-September, the battalion was involved in the battle of the Aisne, which cost it a number of casualties and the following month they found themselves at the Battle of La Bassee, where the battalion suffered terrible casualties, 170 of which were fatalities, on 19/20 October, at Le Pilly, one of whom was John Burke. Not surprisingly, John has no known grave, and he is remembered on the Le Touret Memorial, which sits about 1 mile from Le Touret village on the main road between Bethune and Armentieres. In fact, it is not even 100% certain which day he died on; there is a hand written note on his records that states: ‘To be regarded as having died 19.10.14’. He was entitled to the 1914 Star with Clasp, and the British War & Victory Medals.